This new year 2015, i am planning for hiking and trekking trips to scenic national parks and trails of USA during summer. To see more and more of the natural beauty of this country will be my priority. So far, i have visited mostly the cities of USA and the urban landscape but this time, there is a ‘detour’ in my plan – to head more towards the wild. 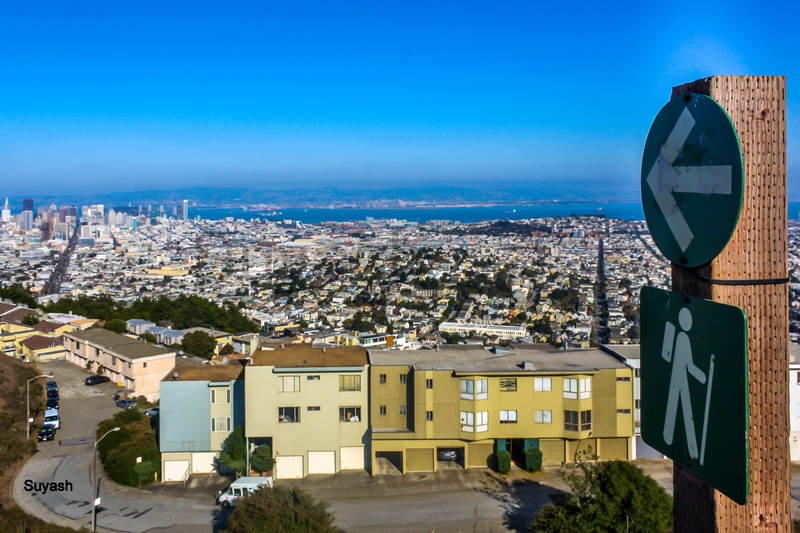 I had clicked this photo while walking up to Twin Peaks in San Francisco. Before me, lay the beautiful view of San Francisco from Twin Peaks. Where are you headed to? More photos of Weekly Photo Challenge: New here. This entry was posted in Life, Nature, Photography, Travel and tagged Happy New year 2015, Hiking, Nature, Photography, Travel, Trekking, USA, USA National Park. Bookmark the permalink. Wow! You have traveled many places and I’m excited to see even more of your journey! I don’t get to travel far so it’s nice to see other places through other’s eyes and photos. Will do! Have a great day as well! So many fabulous parks to see and experience. Our Sleeping Bear National Lake Shore is a majestic trip along Lake Superior’s southern shore then south along our spectacular five mile long Mackinaw Bridge. You can continue following the path along the great lakes past Niagara Falls on into New England. Or west, ‘go west, young man’. Super planning and ideas. Just loved reading the article. So interesting. All the best for the share. Happy New Year 2015. Thats incredible. Have a great year exploring places and hiking. Will share our experiences and multiply our fun 😉 Have a blast.. Sounds like a great plan! Enjoy on my behalf, since I think I will mostly be staying local to California and the West Coast. Keep sharing! Of course! I cannot wait to see pictures and please let me know your favorite spots. Have fun and safe travels! Thanks a lot dear for follow on FB and your wishes…wish you also a great fulfilling year…Cheers..!!! Wow..sounds like a great plan ! Have fun..and lovely picture .. It seems like a great plan!! My best wishes for 2015! !